The short answer: The Fed is attempting to exit the mortgage-backed securities market. On March 31, 2010, the Federal Reserve ended its $1.25Tn direct intervention in the mortgage-backed securities market. The original goal of the emergency intervention was to keep mortgage rates from rising, and more importantly, to prevent adjustable-rate mortgages from resetting at higher rates, thereby pushing borrowers into foreclosure. The corollary goal was to prevent higher mortgage rates from eating a larger portion of disposable income at a time when Kensyians were - and still are - attempting to maintain aggregate demand. As part of the exit strategy, it appears that the Fed is extending a historically unprecedented amount of direct credit to the banks...$400Bn in mere weeks. This is NOT monetary credit - the money lent to banks at the discount rate - since the Fed has reached the zero-bound and can no longer lower the discount rate to increase liquidity (the "liquidity trap" - or "event horizon" as I call it). Rather, this is direct "quantitative easing" and amounts to direct loans to banks. Presumably, the Fed is requiring some kind of collateral on these loans, and, I presume, this is in the form of preferred stock. The Fed has few other options. The Fed's ultimate stated goal in ending its intervention in the MBS market is to reduce its balance sheet and allow the commercial sector to shoulder this portion of the market again. Whether this will work is the question I will attempt to expand on. The most important thing to consider is whether the market is functioning. In the aftermath of the Lehman (OTC:LEHMQ) failure - the pin that pricked the bubble - the mortgage-backed securities market was thrown headfirst towards a state of market failure. The essential price discovery mechanism broke down, as banks no longer had the ability to measure counter-party risk. Was my counter-party over-leveraged 10,000% with various collateralized debt obligations (CDOs)? Were those CDOs properly rated by the rating agencies? Should I make a deal with my counter-party with full disclosure of my own CDO positions when I'm not sure what the value is of those CDOs (and the various tiers of MBSs contained therein)? Would this disclosure give my counter-party the information necessary to make CDS bets against my holdings? Of course, not all of these questions were asked by all of the players. Some of them didn't realize the explosive nature of their liabilities. Some players - not naming names - were even enthusiastic to sell credit default swaps against their own CDOs, CDOs comprised, in some cases, of ONLY negative amortizing adjustable rate mortgages (a scenario worthy of a banking Darwin award, if ever there was one). But such horror stories aside, the fact that these questions were being asked posed a significant impediment to the price discovery of MBSs. We all know the rest of the story. This breakdown of the price discovery mechanism in this portion of the wider economy caused the velocity of the transactions within the MBS market to plummet. Parties stopped trading. Worse, the contagion spread to the other credit markets. Consumer credit, linked directly to the MBS market by way of home equity (among many other connections), froze. With consumer credit freezing, aggregate demand could no longer be forecasted. Commercial credit rates began to spike. The TED Spread spiked. The American market was losing its liquidity... not in the sense that loanable funds were being withdrawn, but in the sense that the velocity - the fluidity, if you will - of the economy-wide portfolio was collapsing. Suddenly, the same counter-party questions being posed among commercial and investment bankers were being posed among international bankers. Fast forward almost two years to today. WILL THE EXIT STRATEGY WORK? The Federal Reserve is withdrawing its support from the MBS market. This was, essentially, the finger they used to plug the bubble. But has the Fed addressed any of the underlying concerns? I believe the clear answer is no. No financial reform has been enacted. No clearinghouses for MBSs, CDOs, or CDSs have been brought to fruition (In a free market, this would have happened, but the Federal Reserve System is not a free market, ergo, to solve the problem, it is incumbent on the Fed and/or Congress to establish such clearinghouses or to dissolve the Fed). The less important issue of "Too big to fail" has overshadowed the price-discovery issues, and these are the issues at the root of the problem. Moreover, what about the ratings agencies? Clearly there is a monopolitstic practice going on here. Much of the subprime mortgages that were wrapped up into CDOs were given AAA ratings. Seeing as there has been no noticeable action take vis a vis the rating agencies, everything is in place for another great credit freeze. This means that not only will mortgage rates begin to rise again, so too will the TOTLL figures, as the Fed will lend more and more money to banks that are unable to measure counter-party risk and are therefore unable to loan those funds out. Even worse, there are less parties in the market since the last phase of the contraction caused massive consolidation. The Fed's attempt at a backdoor exit from the MBS market will fail. In little over a week they've lent $400Bn to commercial banks. One can assume, they'll keep pushing money at the banks until someone on the Board of Governors realizes this isn't working. And if I were in the FOMC meeting, I wouldn't be holding my breath. This much can be known, as mortgage rates rise, so too will defaults and foreclosures. Banks will own more homes. 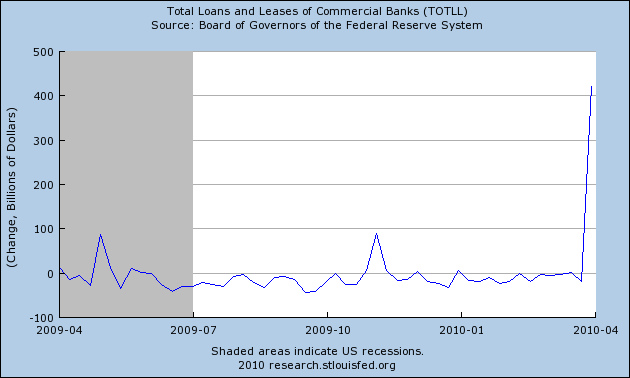 And eventually, when the banks can't pay these Fed loans, more banks will go into FDIC receivership. This will unleash a new wave of bank failures and bailouts. Perhaps this is a cleaver ploy to ensure passage of a Fed-friendly financial reform package. I tend to think the Fed simply doesn't know what it is doing.